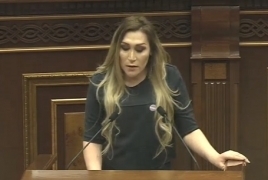 PanARMENIAN.Net - A trans woman took the stage on Friday, April 5 after delivering remarks at the Armenian National Assembly in Yerevan. Addressing a panel titled “National Human Rights Agenda: United Nations Universal Periodic Review”, the person revealed her identity as Lilit Martirosyan and said she is happy “to get the chance in post-revolution Armenia” to deliver remarks at the parliament. Her speech angered the chairwoman of the human rights and social affairs committee, lawmaker Naira Zohrabyan who reminded that the panel was dedicated to judicial reforms, the rights of children and persons with disabilities. According to Zohrabyan, Martirosyan’s address contradicts Friday’s agenda. The trans woman then demonstratively left the National Assembly hall.